This is a biography of Louisa May Alcott's rags to riches life. She is best known as the writer of Little Women, published in 1868, but was also an active abolitionist during The Civil War. This book takes us through the hardships of her life; the many moves, and the many adjustments her family had to make along the way. We can see how Louisa May Alcott became such a strong person who was always looking for ways to help her family. I believe this is one of the best biography picture books I have read. 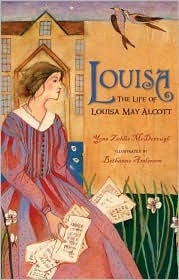 As a reader of Little Women as a child, I really enjoyed learning about Louisa May Alcott and her journey of life.